a picture of it...mmmmm delicious ! Heat up the steamer under high heat till the water boils before putting in the fish. Mix the above sauce ingredients together into a paste. 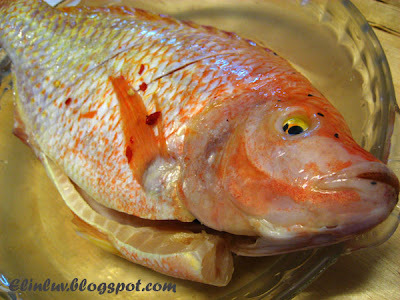 Place fish on a steaming dish and pour the sauce over the fish. Steam the fish under high heat for 10-12 minutes till fish is just cooked. Over steaming will cause the fish to be tough. Garnish with italian parsley or spring onions. Looks tasty! I've never steamed a whole fish. hey, the other day i bought the plum sauce, my girl said it was very nice.. something different from the normal taucheong.. thanks for recommending.. will use this plum sauce more often now for steaming fish.. 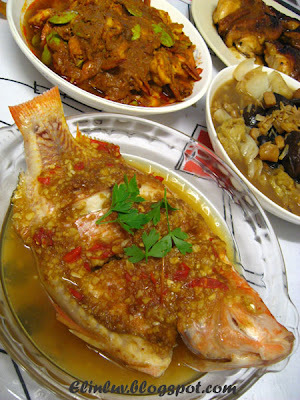 This is my grandma's favourite way of eating her fish, commonly ordered when we dine out. Though seldom steam fish at home, for we have our dinners separately, and cold steamed fish is unpalatable. Looks good. I've never steamed the whole fish. 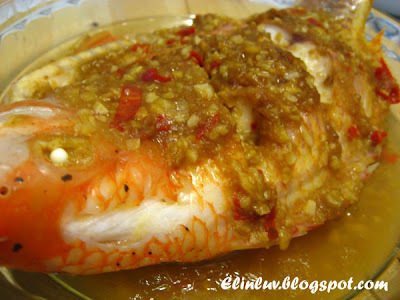 Lovely dinner, I make steamed fish often and like the plum sauce recipe! 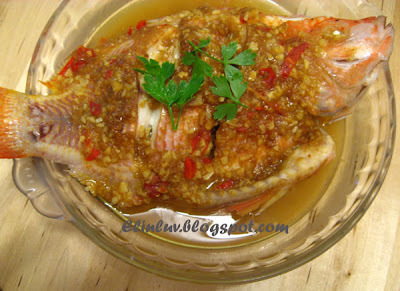 I love steamed (or braised) fish! 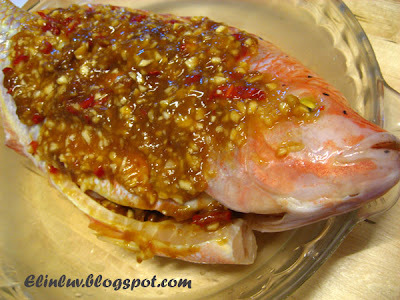 A steamed red snapper with hot and sour plum sauce sounds divine. Hi TEAH...haha you should try...it's chinese 's belief that eating fish complete with the head and tail means there is a beginning and an end to a task. Hi Gabriel...haha sorry I seems to make you hungry all the time LOL! 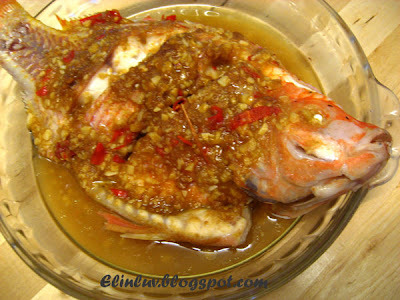 Hi Zurin...you must try this style of steaming fish...I am sure you will love the hot and sour flavor! delicious!!!!! you are fantastic cook..